This third-grade descriptive paragraph tells about a make-believe neighborhood. Meet my neighbor Lucy Botticinni! She goes by her Italian name, Chiara. She has a lot of imagination. She had us make houses under the palo verde tree in her front yard. We wove the branches in with tumbleweeds and swept the ground. We dug little holes and filled them with palo verde leaves and covered them. We leave the leaves until they mildew. Then they are money, and we use them to get groceries and things. I brought my marionettes from Nogales, Mexico, and we made a puppet stage under a branch and had a show. Last week I went in the morning to my mildew house and a fox was sleeping there. He was glad I swept the floor! 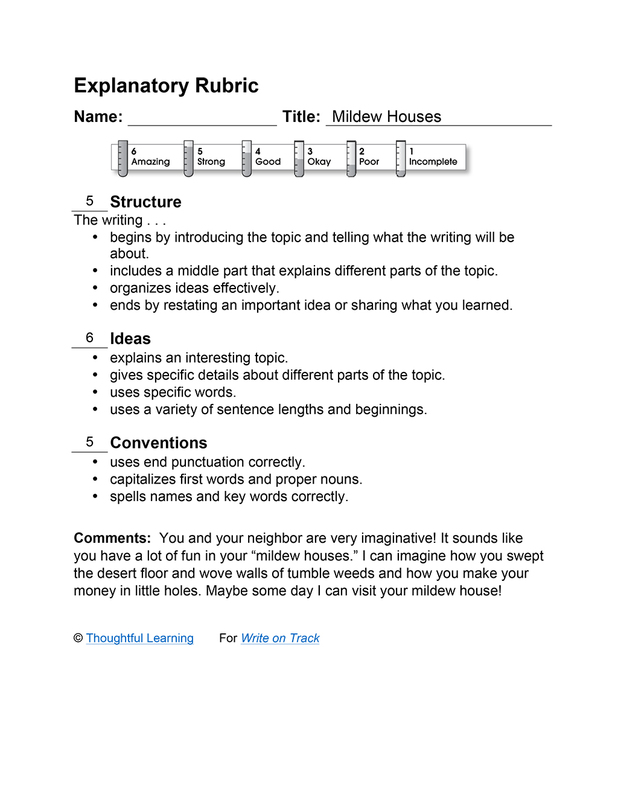 Mildew Houses by Thoughtful Learning is licensed under a Creative Commons Attribution-NonCommercial-ShareAlike 4.0 International License. Based on a work at k12.thoughtfullearning.com/assessmentmodels/mildew-houses.